That might not be what you wanted to hear, but I just want to set the record straight. I am a mum, and a new one at that, I am an avid cook, a recipe writer and a nutritionist. But I am not an expert. When do you become one? After 10 children? When you have the right number of followers on Instagram? I don’t know what the tipping point it, but I just thought I would let you know that I haven’t reached it. I am muddling along, like every parent out there. Some days I kind of nail it & I do a little dance. Other days not so much. This site is for me to show what is happening in my kitchen. To share recipes that have worked for my family and that will hopefully work for yours. Because is there anything more beautiful that feeding a baby? What I can promise is that every recipe I post on here I post because we loved it. Because it has been gobbled up, smooshed into a chubby hand, clumsily stuffed into a hungry mouth. I will post recipes because I want to share them, so that you can watch happily as your little one eats happily and then plays and rests with a belly full of goodness. We have found that the pureeing stage didn’t last long in this house. The mini foodie is determined to grab food and feed herself and so we let her. We now do both. We spoon feed certain food and meals but there are also always ‘self feeding’ elements – cucumber batons, or pasta twirls or a stalk of broccoli to explore and of course there are days when it all seems to end up on the floor (much to the joy of the dog). 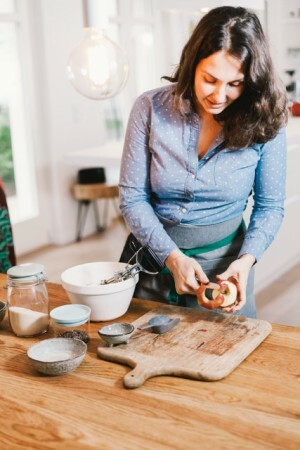 As our daughter grows the recipes will evolve to include recipes that will work for the whole family so you can pull up a chair and eat together.